With Tangled (2010) and now Frozen (2013), Disney's once floundering in-house animation studios have equaled and even exceeded the standard set by Pixar. Of course, with John Lasseter in charge of both, that may have become a distinction without a difference. Nevertheless, while Pixar continues to project an aura of artistic sophistication unmatched by its competitors—perhaps reflecting the lingering influence of its founder—Disney Animation productions strike me as more broadly human in their dramatic appeal. And certainly more broadly comedic. Many of the laugh-out-loud moments in Frozen come from the efforts of the snowman Olaf to literally keep himself together. He's a one-man Calvin & Hobbes running through the movie, totally hilarious in a somewhat disturbing way when you stop to think about it. Humor of a more urbane sort is provided by Anna (the redhead) and Kristoff. Disney has again tapped into the snap, crackle and pop of the great screwball comedies. To be sure, Anna, Kristoff (and the reindeer) are a copy of Rapunzel, Flynn Rider (and the horse). Hey, with repartee like this, more of the same is fine by me. Frozen dares to lead with a pair of antitheses, not only bad consequences springing from good intentions, but ill-intentioned people successfully pretending to be good. Tangled gives us one too, but the audience is in on the deception from the start (that Rapunzel's "mother" is evil). 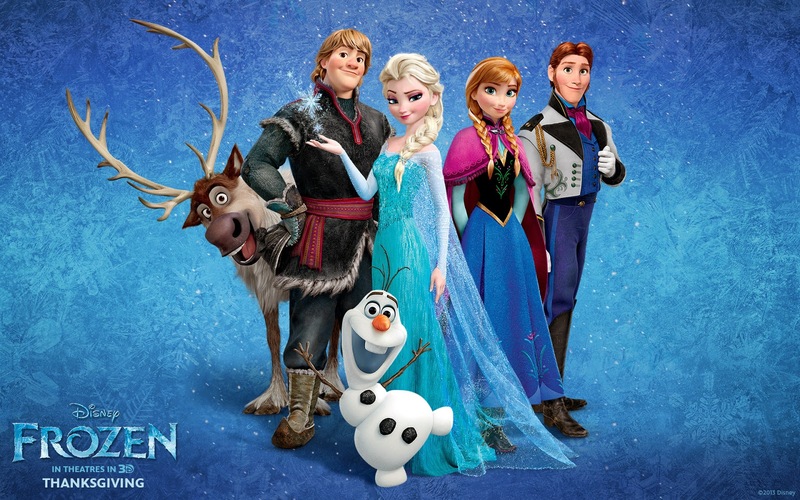 The ingenious touch is Elsa's barn-burner of a power ballad, "Let it go." It sounds at first like an anthem for the self-esteem movement. Except that, by the end, it's become clear that Elsa "being herself" will kill her sister and destroy her kingdom with a Midas-like curse that turns everything she touches to ice. Elsa doesn't need to "let it go." She badly needs to get over herself. That's what the movie is actually about. To be fair, Elsa doesn't understand herself or her own abilities. As she and her world change, what she has to "let go" evolves too. She's not the only one. Anna needs to grow up. Fast. Falling in love with some random guy at first sight is a really bad idea, especially when it's just an excuse to get out of the house. There's a great scene where Kristoff says, "Maybe your sister wants to be left alone," and Anna replies, "Nobody wants to be left alone." Ah, spoken like every clueless extrovert who's ever lived. Prince Hans, the object of Anna's initial affection, is a fairly complex fairy tale antagonist, the stereotypical nice guy who isn't. Though it wasn't as big a gotcha as I thought it'd be. Nice guys don't chain up the queen in a dungeon. But isn't he simply "being himself" and looking out for his own self-interests? With twelve older brothers, he probably has self-esteem issues too. Well, tough nuts, kid. That doesn't justify being an exploitative, homicidal jerk. I appreciated how unsentimentally the tables are turned on him in the end. No instantaneous change of heart or slap on the wrist after "lesson learned," thank goodness. Speaking of changes of heart, the one other failing in the film (aside from the missing backstory explaining Elsa's "gift") is the same one I noticed in Tangled: rushing through the "emotional resolve" (Rapunzel's reunion with her parents is cut too short), especially when the denouement starts on such a great note. After all, Elsa has just brought her sister back from the dead. A few moments of reflection, a little hesitation, some sisterly recognition and encouragement (the first song in the movie, "Do you want to build a snowman?" poignantly establishes the depth of their relationship), would make the payoff all the more profound. And one minor linguistic quibble. No, not the droll anachronisms scattered throughout the script. I love those. A mere one word in the lyrics. Specifically, the vagueness of the antecedent in "Let it go" bugs me. Let what go? Granted, as noted, that vagueness does allow the meaning to adapt to an ever-shifting context. Still, I think the Japanese translation improves on the original with the phrase ari no mama ("[take me] as [I] am"). Takako Matsu delivers a bravura performance. Here's the English version sung by Idina Menzel. Quibbles aside, she does very well as Elsa. Oh, and stick through the credits to the very end. First for the "legal disclaimer" that comes right after "Production Babies" (get out your magnifying glass). And then the abominable snowman makes a curtain call. I enjoyed this movie very much though my initial reaction was also that it ended way too abruptly. So I'm going to watch it again! But still. It's hard not to compare it to Tangled (as you point out, Eugene, it has many of the same elements), and the ending of Tangled seems rather more satisfactory to me. There's a whole bunch of sacrificing going on at the end of Tangled. Frozen's payoff, on the other hand, seems a little too easy (I'm speaking of the very, very end). A kind of--oh, the princesses got the point; can't we just wrap this up already? I do admire the point! * I just watched The Queen (again) and I think the theme of "the world needs leaders who do their duty rather than satisfy their emotional needs on camera" has gotten a boost of popularity in the last few years. I just wish Frozen hadn't come down to "all you need is love." And in cultural phenomenon territory, this is the first "kids" movie I've seen in a long time where people memorize/repeat the dialog--like with Princess Bride; the last time that happened was Shrek when a whole bunch of people in a church meeting, no less, starting repeating, "Not my buttons!" when a member brought in gingerbread men. *The creepy prince is also well done. The clues are all there; they just aren't immediately obvious. And "Let It Go" kind of blows ya out of the water. "Wow!" I said when it ended while the family showing me the movie (whose daughters know it by heart) beamed.